Browse: Home / Politics / eBay: Pro Scalping? “Today in your state capital, proposals for legislation are being drafted that claim to support an open market for buying and selling concert or sporting event tickets. But these proposals also include a variety of controls that will govern how you can buy or sell, what you can charge, or who can sell the ticket for you. Some of these proposals would even allow corporations like Ticketmaster to decide how and when you can resell your ticket. They support “venue authorization” which would allow Ticketmaster and the venue to decide whether or not to allow the ticket to be resold. Free market advocates vigorously oppose this idea because it allows corporate interests (instead of fans and small businesses) to control the secondary market. The truth is that these proposals all lead to a market that drives down supply and prices up–and that hurts consumers and sellers alike. Most other states allow ticket free trade, which benefits both fans and small ticket businesses by giving them access to more tickets at lower prices. 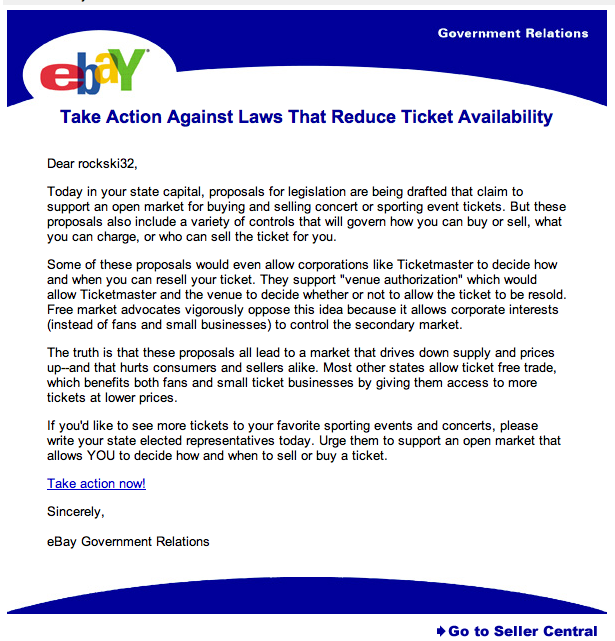 Seems that eBay is opposed to the anti-scalping laws the state of Massachusetts is attempting to get passed. I personally don’t think eBay has anything to worry about as we’ve heard this type of posturing from the Massachusetts legislature before. Massachusetts law already prohibits selling tickets above face value (or for face value plus a $2 fee), yet anyone who goes to a Red Sox game will tell you scalping is alive and well. There’s literally a group of scalpers down the street from Fenway Park hawking tickets mere yards from police officers. It’s nearly impossible to buy tickets legitimately to a Red Sox game anymore thanks to all the scalpers, but at least I can bid on tickets on eBay and have a chance at getting a fair deal. The Massachusetts legislature should focus on enforcing existing laws rather than posturing for the public. Enforcing the current laws may get more of the scalpers off the streets and onto the internet, thereby increasing supply and competition and hopefully bringing prices down for the end-user. Sure, in a perfect world there would be no scalping and we could all buy tickets at face value and plentifully; unfortunately, we don’t live in a perfect world and neither the Massachusetts legislature nor eBay can bring ticket prices to high-demand events, such as Boston Red Sox games, down to an affordable level for the average fan, while ticket scalpers are allowed to flaunt their highly marked up prices.